The Goldendoodle (Groodle in Australian English) is a cross-breed dog, which is obtained by breeding a Golden Retriever with a Poodle. The name, which alters “poodle” to “doodle” by analogy to “Labradoodle”, was coined in 1992. The Goldendoodle was first bred by Monica Dickens in 1969. Popularity for the goldendoodle grew in the 1990s when breeders in North America and Australia began crossing Golden Retrievers with Standard Poodles. The original purpose of the cross was to develop guide dogs suitable for visually impaired individuals with allergies. Poodles are considered to be hypoallergenic. Their coats do not shed, which reduces dander. Dander is a protein that sheds from the skin and causes allergies in humans. The goldendoodle is referred to as a designer dog. The Encyclopædia Britannica traces the term “designer dog” to the late 20th century when breeders began to cross purebred Poodles with other purebred breeds in hopes of obtaining a dog with the poodle’s non-shedding coat, (but there is no guarantee they will inherit the coat of the poodle), along with various desirable characteristics from other breeds. 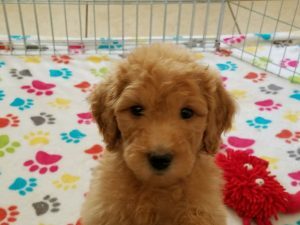 In regards to goldendoodles, golden retrievers are considered a great family dog, which is why they have been used to cross breed with poodles. Over time people made different kinds of Goldendoodles. A male Poodle bred with a female Golden Retriever produces an F1 Goldendoodle. A male Poodle bred with an F1 Goldendoodle is called an F1B (F1-back cross). *Pet rating based on the average dynamic of the breed. All dogs may vary in temperaments, size and training. If you are concerned about the specifics of a certain breed, please research fully before purchasing. *The Paw Palace carries certain breeds but sometimes they may not be available. Please click the selections below to see the availability of this breed and your options to purchase them. If we do not carry the specific breed you are looking for, we do work with several licenced USDA breeders that may carry the specific breed and may be able to special order them. Please contact us if you have any questions.